Top 9 supercomputers in a fun online IT learning game. "Top 9 Supercomputers 2018" is a free online knowledge level game to explore the most powerful supercomputers to 2018. Minute to win it game. Computer Technology Class for desktop computers, laptops and tablets, which may be played in the web browser. Sort the supercomputers by PFLOPS speed, year and country. IT learning game, suitable for online classes and interactive lessons. Free online educational game. Lesson 1b for 9 grade clasroom game. 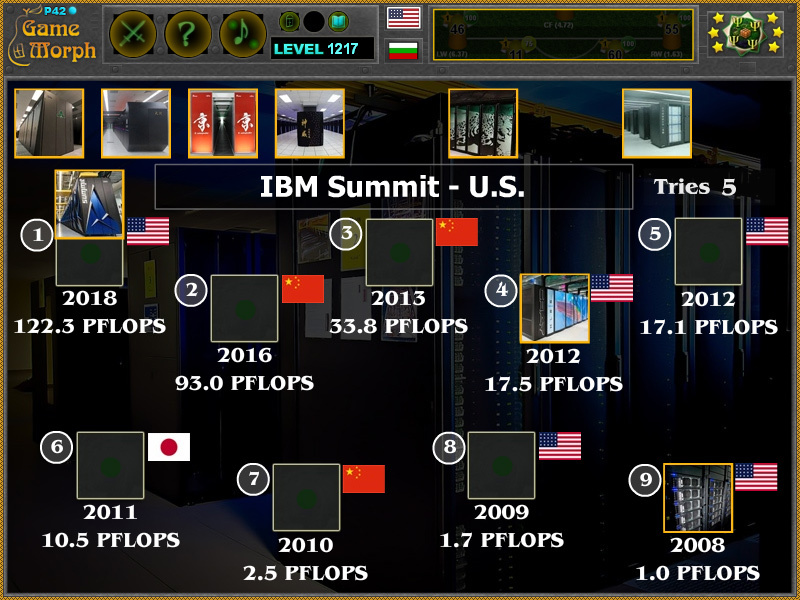 2018	IBM Summit	122.3 PFLOPS	Oak Ridge, U.S.
2012	Cray Titan	17.59 PFLOPS	Oak Ridge, U.S.
2012	IBM Sequoia	17.17 PFLOPS	Livermore, U.S.
2009	Cray Jaguar	1.759 PFLOPS	Oak Ridge, U.S.
2008	IBM Roadrunner	1.026 PFLOPS	Los Alamos, U.S.
How to play Top 9 Supercomputers 2018. There are 9 photos of supercomputers at the top of the screen. Drag and drop them in the correct slot, showing the FLOPS, the year and the country flag. Sort all 9 supercomputers to win the game. Know 3 powerful supercomputers and get +1 Knowledge Level. Class subject: Top 9 Supercomputers 2018. From Wikipedia: Since 1993, the fastest supercomputers have been ranked on the TOP500 list according to their LINPACK benchmark results. The list does not claim to be unbiased or definitive, but it is a widely cited current definition of the "fastest" supercomputer available at any given time. The history of supercomputing goes back to the early 1920s in the United States with the IBM tabulators at Columbia University and a series of computers at Control Data Corporation (CDC), designed by Seymour Cray to use innovative designs and parallelism to achieve superior computational peak performance. The CDC 6600, released in 1964, is generally considered the first supercomputer.However, some earlier computers were considered supercomputers for their day, such as the 1960 UNIVAC LARC, the 1954 IBM NORC, and the IBM 7030 Stretch and the Atlas, both in 1962. While the supercomputers of the 1980s used only a few processors, in the 1990s, machines with thousands of processors began to appear both in the United States and in Japan, setting new computational performance records. By the end of the 20th century, massively parallel supercomputers with thousands of "off-the-shelf" processors similar to those found in personal computers were constructed and broke through the teraflop computational barrier. Progress in the first decade of the 21st century was dramatic and supercomputers with over 60,000 processors appeared, reaching petaflop performance levels. This fun classroom game is an exciting occupation for the Supercomputers lesson.